Appearance: There is a bit of a chill haze to this burnished copper colored brew. The almost white head of loosely knit medium and large bubbles tat a fine Belgian lace as it slowly recedes. Aroma: The sensation is a crisp hop flower sensation… the second pick up some toasted malt but just a trace. The third deep aromatic reception brings more of the malt to the front. Mouth feel: This is a fairly full bodied brew but not flabby. Flavor: The moment between first is a refreshing sensation followed by a sweet burnt candy flavor that is rushed out of the way by the spikes of hop flavors. These hop notes are aggressive but not offensive. The second sip revealed how well the sugars and bitters blended. The third swallow asked for another but not too soon. Finish: The finish takes some time to finish its job. Actually it is long enough that you don’t want to dive right back in… rather relax and enjoy. Comments: The grounds staff were mowing the lawn in front of this building so I was “sensually distracted” until the window was closed. However, the flavor profile was nicely balanced. The long finish lends more to contemplation than quaffing. A bowl of shelled walnuts and three or four samples of local cheddar cheese would do this brew no harm. BEND, Ore. – The newest member of the Deschutes Brewery Bond Street Series is set to debut in mid-May: Red Chair IPA. Like the other beers in the Bond Street Series, Red Chair IPA began at the community Pub on Bond Street in downtown Bend, Oregon. These hop-centric ales are available only on tap and in 22-ounce bottles. The Bond Street series also includes Hop Trip, a fresh hop pale ale, and Hop Henge IPA, an experimental IPA. All beers in the Bond Street series were initially available only at the downtown pub in Bend, which has gained a reputation as a venue for Deschutes’ brewers to experiment with innovative recipes. 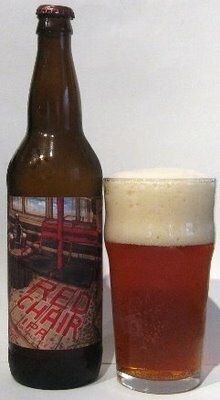 Brews that become wildly popular with the locals eventually make it into bottles, and Red Chair IPA is a prime example. Red Chair IPA will be available throughout the western U.S. from May until September in retail establishments that carry the Bond Street Series. The brewery team recommends pairing Red Chair IPA with hot-n-sour soup, enchiladas with mole sauce, or thin crust Margherita pizza. The long, slow ride up the Red Chair lift at Mt. Bachelor. If you don’t live in Central Oregon, a front porch swing will do.